Gay-rights advocates are cheering Tuesday's decision by a federal judge in conservative Riverside, Calif., to order an immediate end to the military's discrimination against gay service men and women. The Justice Department has not yet said whether it will appeal the order, which applies to the U.S. military worldwide, but already many supporters are calling on President Obama to let the ruling stand. Once again, the President finds himself outflanked by activists, this time the Republican gay-rights activists who sued to stop the "Don't ask, don't tell" policy and who keep winning in federal court even as Obama struggles to keep his promise to end discrimination against gays. Choosing not to appeal carries big risks, and not just for the President. It's true that most Americans support ending the military's discrimination against gays. And it's true that the House has already passed a bill repealing "Don't ask, don't tell" (though the Senate has so far refused to follow suit). And yes, appealing would mean going to court to defend a law the President has himself denounced as unfair and wrong. But if Obama does not appeal, it's likely that no one else will have the standing to do so. The result: a single trial judge would then set policy for the entire country on a question of fundamental importance  a situation that the Administration perceives would be an uncomfortable one for a substantial number of Americans. It's a box Obama finds himself in more and more when it comes to gay-rights issues. Even as U.S. District Judge Virginia Phillips was issuing her worldwide injunction to the military on Tuesday, the Administration was filing notice that it will appeal a federal ruling in Massachusetts that earlier this year struck down another law that is anathema to gay-rights supporters: the 1996 Defense of Marriage Act. In its filing, the Administration called the law unfair and said it ought never to have passed but nevertheless argued that it does not violate the Constitution. 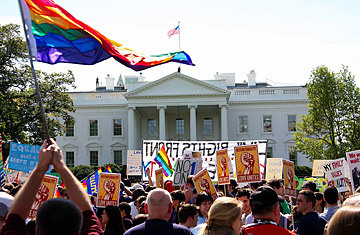 That prompted gay-rights bloggers and others to cry foul, warning that their patience with Obama, who most argue has yet to keep his promises to gay and lesbian supporters, is running out. Letting Judge Phillips' ruling stand would be a good way to get gays and lesbians off the sidelines. But allowing a single judge to overturn "Don't ask, don't tell," without any review by a higher court, could raise questions of legitimacy, and not just about the "Don't ask, don't tell" decision. Gays have won a remarkable sweep of victories in federal court this year, with judges striking down "Don't ask, don't tell," the Defense of Marriage Act and, in San Francisco, a voter-approved state ban on gay marriage known as Prop 8. Those victories have cheered gay-rights supporters enormously, but opponents pointedly note that Americans continue to reject gay marriage anytime the question is put to the ballot. And while polls show that Americans support the repeal of "Don't ask, don't tell," the fact is that if it were so unpopular, Congress wouldn't be having such trouble repealing it. The gay-marriage case in California has strong parallels to the "Don't ask, don't tell" decision now confronting Obama. The marriage decision is under appeal, with arguments scheduled to take place before a Ninth Circuit Court of Appeals panel in early December. But already, questions of legitimacy have dogged the case. That's because California's elected leaders did what Obama has so far refused to do: Attorney General Jerry Brown and Governor Arnold Schwarzenegger declined to appeal the ruling. For now, a third-party group has been allowed to step in and appeal, but many observers  including the trial judge who heard the case  have said the Ninth Circuit may rule that they lack standing. If that happens, gay-marriage opponents tell TIME, the courts risk damaging their legitimacy. Indeed, those kinds of concerns are one reason that Obama is unlikely to let the "Don't ask, don't tell" ruling stand unchallenged. Former U.S. Solicitor General Theodore Olson, one of the lawyers who brought the successful challenge to Prop 8, told TIME this summer that the White House nearly always defends statutes in court, whether the President agrees with them or not. There are exceptions, he said, but they typically involve laws that the President believes are clearly unconstitutional or that infringe upon the constitutional power of the Executive Branch. But no matter what happens, Judge Phillips' ruling stands as a powerful vindication for gay-rights supporters and for the many critics of the military's discriminatory policy. Enacted after President Bill Clinton failed to lift the ban on gays in the military altogether, the policy had kept in place the military's blanket prohibition of gays serving in its ranks, but also set up strict rules for when and how officers could inquire whether a member was gay. As long as a soldier did not announce his or her homosexuality and avoided doing anything that revealed it, the military was barred from asking. It was an uncomfortable compromise from the beginning. Between 1993 and 2001, the military discharged some 7,856 service members, according to Phillips' 86-page ruling. After the wars in Afghanistan and Iraq began, the rate of dismissal declined, but didn't stop: another 5,167 were dismissed between 2002 and 2009. At trial, gay soldiers and officers testified to the corrosive effects of the policy. One such witness was Air Force Major Michael Almy, a decorated officer who served three tours in Iraq. He testified that he came out to himself as a gay man a few years after his enlistment, but never told anyone in the Air Force of his orientation. In 2005, 12 years after his enlistment, someone searched the private e-mails on his computer and found a message by Almy "discussing homosexual conduct," and as a result, the major was eventually discharged. Hearing that story and others, Phillips ruled that the military's treatment of gays and lesbians offends the basic notions of decency in the country and is illegal. With Obama likely to appeal, the question becomes whether Tuesday's victory for gay rights will stand as just another moral victory or become the law of the land.